Louise Heilbron, who has for many years delivered Holocaust sessions in schools and synagogues and facilitated on the Lessons From Auschwitz project at The Holocaust Educational Trust has been awarded an Honorary Degree by Middlesex University at its graduation ceremony today. “It is really a great honour and delight to receive this prestigious award from my local university,” says Louise. Having been involved in the Northwood Project (Holocaust education taught in synagogues) from its inception in 2000, Louise Heilbron set up an education programme at Finchley Reform Synagogue to encourage more synagogues to offer similar outreach activities for Holocaust Memorial Day. The project is now up and running in many local synagogues enabling students to hear survivors speak and also participate in workshops. Teacher trainees from Middlesex University have also attended for many years. Some of those attendees are now teachers who bring their own students each year. Louise gained an HND in Business Studies from Brighton College. She continued studying, gaining a teaching qualification from Leeds University and a humanities degree from the Open University. She then spent many happy years as a primary school teacher and special needs co-ordinator while raising three daughters. 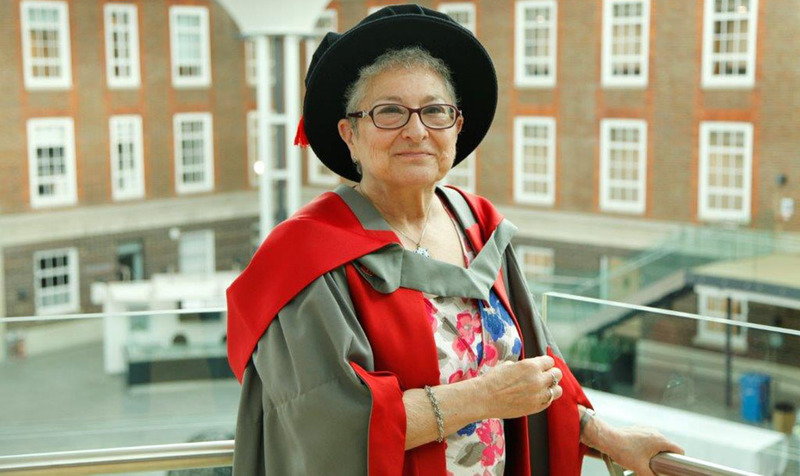 During her time in schools, she gained an MA in Jewish Education, became a bereavement counsellor, helped to set up Yad b’Yad (a child death helpline) and was a supervisor on the Child Death Helpline at Great Ormond Street Hospital. Following a stroke, she gave up teaching but was able to continue with educating at the British Museum, the British Library, the Imperial War Museum and the Jewish Museum. However, her main focus is now on Holocaust Education.